Public Finally Realizes Military Failed in Iraq & Afghanistan, But Will Pentagon & Pols Learn? 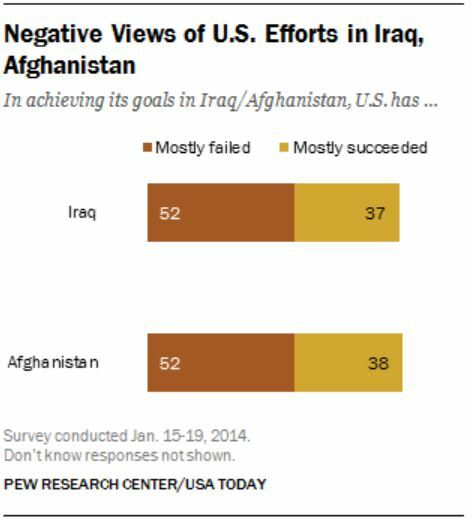 At long last, after over twelve years of war in Afghanistan and nearly eleven years since the invasion of Iraq, the majority of citizens in the US admit that the vaunted US military failed to achieve its goals in either effort. A Pew poll released yesterday showed that in nearly identical results, 52% of Americans feel our goals were not met in either country, while 14 to 15% fewer felt we had met our goals. Back in August, Lt. Col. Daniel Davis had one prescription for addressing these failures when he argued that it is time to “Purge the Generals“. I quoted extensively from his analysis in a post shortly after it was published, but one of the primary points from Davis is that for too long, military leaders have lied about the status of military missions and never faced any consequences for their false claims of success. We have seen a partial purge of higher military ranks lately, but these removals have been primarily for offenses that have caused acute embarrassment to the military, such as being caught using counterfeit poker chips in a casino. Congress also plays a huge role in the promotion of lies about success in military missions. As I noted last April, Armed Services Committee member Jack Reed delighted in getting Dunford to enter into the record a statement that we were “winning” in Afghanistan at the time. The Pentagon and other inhabitants inside the Beltway would benefit greatly from some soul-searching into just how these two misadventures were allowed to start in blind rage and then be so badly mismanaged for so long. Of course, that will never happen, but we now have reached the stage where the folks who have paid the bill for the fiasco realize that the lives, money and effort have all been wasted. With public opinion running so strongly against the two latest high-profile wars, our politicians and the Pentagon will have to content themselves now with more clandestine actions using the Special Operations Forces that are deployed in over 100 countries around the globe. https://www.emptywheel.net/wp-content/uploads/2016/07/Logo-Web.png 0 0 Jim White https://www.emptywheel.net/wp-content/uploads/2016/07/Logo-Web.png Jim White2014-01-31 09:59:442014-01-31 09:59:44Public Finally Realizes Military Failed in Iraq & Afghanistan, But Will Pentagon & Pols Learn? Davis:… for too long, military leaders have lied about the status of military missions and never faced any consequences for their false claims of success. Serving U.S. Army Lt. Colonel Danny Davis has been attracting notoriety following his courageous statement that senior military commanders have been systematically deceiving the American people about the war in Afghanistan. As he points out, breezy assertions of “momentum,” and “progress,” as well as “hard fought achievements,” are belied not only by his personal observations in the field but also by easily available public information, most strikingly the remorseless up-tick of casualty statistics and enemy attacks even after the “surge” of the last few years. But Davis has also cited an example of official military mendacity unrelated to Afghanistan that deserves more attention, since it is part of a pattern that will not go away when the troops come home.. . .Despite repeated test failures, witheringly chronicled in regular reports from the General Accounting Office, senior army commanders testified with equal regularity that all was well, even displaying what was essentially a dummy in front of the Capitol as a “real” armored component of FCS. As Davis states in his leaked unclassified report “Dereliction of Duty,” when faced with “failure after failure in physical tests” the generals “willingly and knowingly misrepresented the matter to congress.” The program relieved taxpayers of some $20 billion before defense secretary Robert Gates finally cancelled it in 2009. Think $1.5 trillion F-35, twelve years in development, dozens being produced at $200m each, still doesn’t work as advertised. The Joint Chiefs of Staff have studied it. In general, operations during the first half of the decade were often marked by numerous missteps and challenges as the US government and military applied a strategy and force suited for a different threat and environment. Operations in the second half of the decade often featured successful adaptation to overcome these challenges. . . In the US military, every activity is successful, by definition. So are we circa 1974? 1972? 1969? Wondering where we are, roughly, if history repeats itself to any significant extent. It does seem to be repeating itself in some ways. After Vietnam we went big on covert wars. We had the Church Commission. All kinds of things. Which is why I keep arguing that the correct (if likely impossible) policy action is to take apart the fundamental legislation (National Security Act of 1947 and subsequent related legislation) and reorganize national security institutions from their fundamentals. @joanneleon IMO we are at 1990 again–lost without an enemy and seeking to gin one up. Yes, the US (uniquely in the world) became a militarized state beginning with the National Security Act of 1947, which led to the rise of a national security bureaucracy within the executive branch. American thinking about national security was transformed by this Act and the military establishment rose to prominence, even predominance, in American life. The last thing Obama thinks about at night (he claims) is keeping Americans safe. Actually he took an oath to protect & defend the Constitution, not to keep Americans safe. But the National Security State trumps everything, and now there are security threats everywhere of course — they are essential to the NSS. This is definitely unique in the world; no other nation is so vastly stupid. No other nation has a Clapper. So why is the US military failing once again? One answer, an excellent one, from Evan Munsing, a Marine Corps officer currently serving as a military advisor in Afghanistan. Current counterinsurgency doctrine presumes a national solution to local problems: that a national army, usually with the aid of local police or militias, can come into a fractious area and convince unfriendly locals to ally themselves with the state by bringing security and certain amenities like electricity or economic programs. This strategy requires a functioning and legitimate government and a skilled and disciplined military that can effectively target insurgents who hide amongst the civilian population without causing collateral damage. It assumes that all enemy strongholds must be retaken and that unless the insurgency is defeated in all its parts, the nation cannot survive.
. . . The weakness and incoherence of the Afghan state will doom this approach. . .
Once we leave, the Afghans will find their own local solutions to the problems. That’s funny. Smedley Butler said something about that, too. Funny how Clapper is always too-cute-by-half. Has it really failed? A cynic, not how one would describe most Americans, would say that it’s succeeded – it’s taught that just about any country that stands up to American hegemony will be destroyed and there is nothing the politicians of that country can do about it. And it’s still going on – Syria via US-supported, Saudi-funded proxies (same as Afghanistan), Iran by sanctions, Cuba by sanctions, Ukraine by a neo-Nazi putsch (the last one of those worked really well for the United States), Venezuela….. It looks like the only way to defend yourself now is to equip yourself instantly with nuclear-tipped ICBMs. Smedley Butler said something about that, too. I know. That’s what motivated me to start the Smedley Butler Society ten years ago. I can’t remember where I saw the number, maybe Fed Kaplan at Slate, or Tom’s Dispatch. My memory is that it stated that there are now 990 Flag Officers, Generals and Admirals, on active duty. That’s more than were on active duty during World War II. I agree, it’s long past time for a thorough purge, especially considering the costly perquisites they get: twelve-man “security” details, private chef, personal staff. Hell, General Petraeus even had them fly in fresh pineapple for him. One reason they lie about the weapon systems that actually don’t work is because after they retire at 100% of their active duty pay (thanks, Secretary Rumsfeld for changing that old law)they expect to be hired as “consultants” by the companies that are unable to produce working weapons systems. Unfortunately, there’s no way to remove the worst ones. @Don Bacon: Right. The Pentagon lying just started january 20, 2009. That’s the most ignorant thing I’ve read this year — but be hopeful, there’s still 11 months left.